Onion Parata is a very simple and tasty Punjabi Cuisine. These can be served as breakfast, lunch or even as dinner. 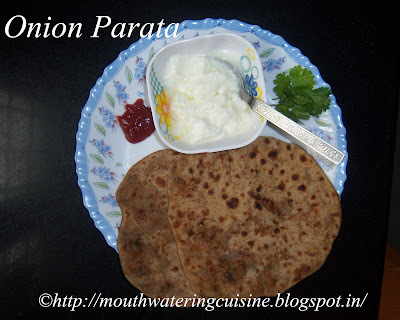 Paratas made with onions and added masalas. Grate onions and add salt to it. Allow it to rest for 10 mins. Chop green chillies and corinader leaves. Squeeze it and keep the water separately. This water can be used to make the dough. In a large bowl, take whole wheat flour, add the above onion water and knead the dough. In another plate, add grated onions add red chilli powder. Add garam masala and cumin seeds powder to it. Add aamchur powder and chopped green chillies to it. Add corinader leaves and Mix it well. Make equal portions of it. Take a medium sized ball of the dough and using rolling pin roll it to make a small disc. Put one portion of onion masala in the center. Bring the edges to the center and combine. Press gently to downwards. Sprinkle some dry flour and roll gently to 6 to 7" inches parata. Heat the roti pan, slowly drop this rolled parata on it. Cook it till the brown spots appear and add a little butter or oil. Cook on both sides till the parata cooks completely. Serve it with curd and tomato sauce or with any pickle.